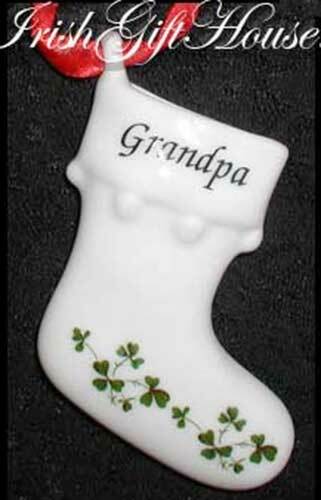 Irish ornament features a porcelain Christmas stocking that is enhanced with the word Grandpa along with shamrocks. This Irish Christmas ornament is ready to hand with the included green ribbon. This Irish Christmas ornament features a dimensional porcelain stocking for Grandpa. The Irish Grandpa ornament is decorated with shamrocks on both sides and the hollow design will hold a miniature gift. The Irish stocking ornament measures 3" tall; it is gift boxed with a shamrock history card, complements of The Irish Gift House. Irish ornament features a porcelain Christmas stocking that is enhanced with the word Dad along with shamrocks. Irish ornament features a porcelain Christmas stocking that is enhanced with the word Brother along with shamrocks.